Hi readers.I am a Windows Phone users too. 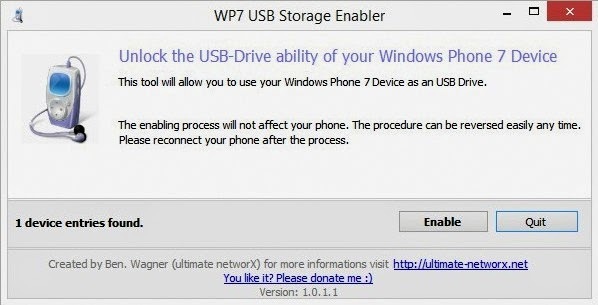 With ZUNE Windows Phone users are not able to transfer files like Documents etc .So here is a tutorial to enable mass storage in Windows Phone 7 so you can use your phone like a flash drive. Follow these steps to enable mass storage on your Windows Phone. There are two methods to do it .Choose the best method you like. 1. Run Registry Editor by typing regedit in the Start Menu search box or go to Start and select Run. Type regedit in the window and click "OK". 3. Click on Edit -> Find or press Ctrl-F to bring up Find command to search for ZuneDriver. 4. In the right pane, edit the following registry values. *Change ShowInShell from 0 to 1. *Change EnableLegacySupport from 0 to 1. This enables Windows Explorer to detect the device when connected. 5. Connect your Windows Phone 7 to your computer, and close out the Zune application. Go to my computer.Now you can see your Windows Phone 7 device as a mass storage device. 3. A window appears like this. 5. If You Don't Want To Use Your Windows Phone As Mass Storage Device Click On Disable. Congratulations You Have Successfully Enabled Mass Storage Access On Your Windows Phone 7.